Beekeepers Sign "LOCAL HONEY FOR SALE". 300mm x 200mm, 19mm thick untreated solid timber plaque with chamfered edges. 50mm high, 3mm thick laser cut untreated ply letters, font style as shown, x17 - LOCAL HONEY FOR SALE​. 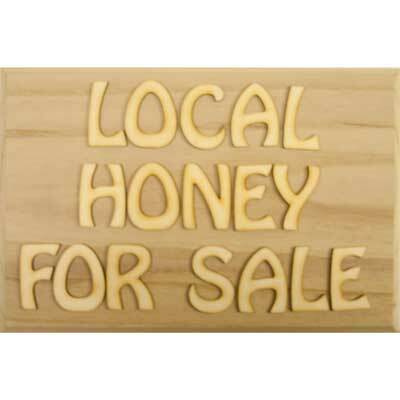 This LOCAL HONEY FOR SALE sign is only an example of what can be created with DIY signs - this sign uses one 300x200mm plaque at £5.80 plus seventeen 50mm letters at 30p each = £10.90.